Ruffin-Steinback v. dePasse, 82 F. Supp. 2d 723 (E.D. Mich. 2000), applied Michigan law to reject claims based on a two-night miniseries covering the story of the musical group The Temptations. The court looked to the Restatement (Third) of Unfair Competition § 46 (1995), which provides for liability for appropriating the commercial value of a person’s identity “for the purpose of trade.” The Restatement explains that the purpose of trade means advertising (or merchandising), but not “ordinarily … the use of a person’s identity in news reporting, commentary, entertainment, works of fiction or nonfiction, or in advertising that is incidental to such uses.” Comment c to § 47 specifically states that “the right of publicity is not infringed by the dissemination of an unauthorized print or broadcast biography.” Ruffin-Steinback noted that courts across various jurisdictions treat unlicensed biography similarly. Thus, the court concluded, “Michigan courts would not extend [the] right of publicity tort” to prohibit biographical works and dismissed all of the derivative claims – unjust enrichment, conspiracy, and negligence – finding that they were dependent on the plaintiffs’ right of publicity claims. The Parks Institute challenged the sale of eight biographical works, mostly books for children “written to educate children about the Civil Rights movement and to demonstrate how one courageous individual can bring about significant change.” There’s nothing false or defamatory about them. The Parks Institute was wrong to claim that the First Amendment didn’t protect the unapproved sale of items depicting “the name, likeness, story, or image of Rosa Parks.” Parks was an iconic heroine of the civil rights movement; the parties agreed that one couldn’t talk about that movement without including Parks. “The importance of her story serves as an apt reminder of why First Amendment protection for biographical works is so vital.” Summary judgment for Target on the books and movie. Newsworthiness/public concern is ordinarily a question of law. The difference is between “predominately commercial purpose” versus “a redeeming public interest, news, or historical value.” Target’s sale of the plaque “served a commercial purpose,” but even profit-seeking endeavors can have a legitimate public interest privilege. For example, a fundraising letter may use quotes from a person without their consent when the quotes speak to important policy issues. 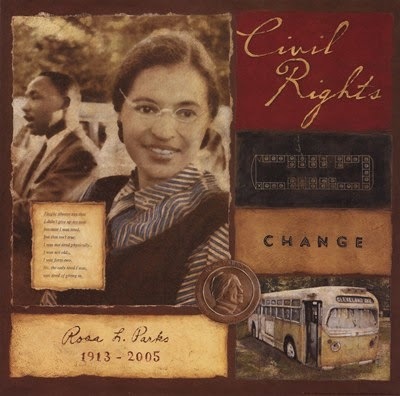 The plaque contained “several elements reminiscent of the historic Civil Rights movement.” The plaque’s creator stated that she sought to inspire viewers to “stand[ ] up for what [they] believe is right” while telling the important story of Rosa Parks’s courage during the Civil Rights movement. “There can be no doubt that Rosa Parks and her involvement in the Civil Rights movement are matters of utmost importance, both historically and educationally.” Thus, the use of her name and image was historically significant and protected by the First Amendment, entitling Target to summary judgment. This entry was posted in first amendment, right of publicity. Bookmark the permalink.